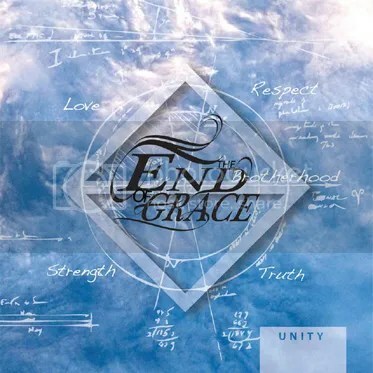 If you know The End Of Grace and have been following their story, you may find this title a bit ironic, given the recent major line-up change in the band. I see it the other way around, a tribute to what makes us one and not what divides us (check the words on the artwork – they’re not exactly random). First of all, the departure of 3/5 of the band had nothing to do with falling outs – it’s just life and its usual way of forcing people to make hard choices; they may not partake in the songwriting and performance anymore but they’ll always be a part of TEoG. And then there’s founder Jimmy Bergman’s passion for this project, which will keep it alive no matter what – a true unity with music. Now that you have my two pennies on the title, let’s go for what really matters. When I’ve last spoken to the boys (interview here) they told me there would be more breakdowns They weren’t fooling around! All songs are much richer in that department, making them sound heavier, thicker. Well, all except the ballad “Fighting For Another Day” (I still smile at the term “ballad” when Kriss Clark is busting up his throat to growl like that, but there’s no other thing to call such bleeding melody) – this one has its own heaviness and there’s no need for extra breakdowns for that. There’s also more riffs/more elaborate guitar structure, more meaningful lyrics and a better complicity between the aforementioned growls of Kriss and the clean tones of Johan. I had the chance to see “The End Of Grace” (yes, they named a song after themselves) in concert (report here) and witness how such briskness works live. Well let me tell you that “If You Fall”, “Never Break” and “Trigger” will cause the same restless effect. This is what metalcore is all about. It’s been already three years since the release of “Lost In Transition” but it seems like yesterday, as those songs keep rolling on my playlists. I’m pretty certain the same will happen with “Unity”. This entry was posted on 3rd June 2016 at 6:22 pm and is filed under 'Core, CD with tags EP, Metalcore, self release, TEOG, The End Of Grace, Unity. You can follow any responses to this entry through the RSS 2.0 feed. You can leave a response, or trackback from your own site.